Mary Jean Craig ’68 couldn’t wait to join 4-H. Her mother and a friend started a pre-4-H club that got her interested, and Craig squeaked into the local fair with a sewing project. After 60 years of involvement in the organization, she knows it was worth it. 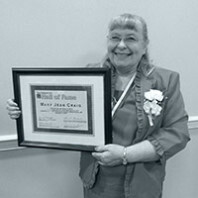 Craig, who lives in Moscow, Idaho, was inducted into the National 4-H Hall of Fame last October for her lifetime achievements and contributions. If there’s just one thing you plant in your garden, make it garlic. For one thing, it’s extraordinarily easy to grow. Plant it around Columbus Day. Cover it with mulch. Or don’t. Water it now and then when it starts growing again in the spring. And that’s about it.